Attires: Nigra, Cancer Patient, Rick Astley. The raid started good. The total of nigras seen was about 40 or more. After some time, nigras' appearance started resembling cancer patients. The patients proceeded to raid the rooms with the remaining nigras. 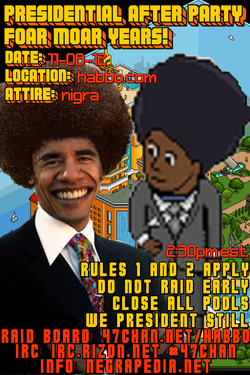 Some newfags attempted to dress up and raid as "Hipsters", they failed badly and the rest kept raiding. When the cancer lost it's momentum, nigras decided to dress up as Rick Astley and raid the B2K Concert room. They eventually got banned, and, at around 6 PM EST everyone quit. It was surprisingly good for a small raid which was planned in only 3 days, with a good number of nigras spotted and enough lulz.